I gave a mini-preview of what move I think will win Best Picture in the MHN. 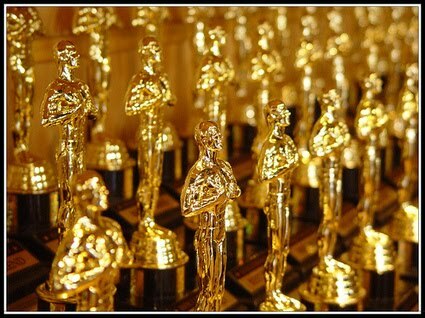 Here is my complete list of Oscar predictions. Who will/should win: Although each actress delivers but no one delivered more than Mo’Nique. Her performance in Precious is by far the best and most chilling nominated. Your jaw literally drops watching this character come to life onscreen. Who Will/Should Win: Christoph Waltz. The only other actor I have some sort of attachment to is Christopher Plummer but I accepted that Waltz (and his likely boring speech) are winning this one. Who Should Win: This is a tie between Carey Mulligan (who won the BAFTA) and Gabourey Sidibe. I can’t think of two performances that deserve an Oscar more.Unfortunately Mulligan and Sidibe are nominated against Sandra Bullock and Meryl Streep, two big names who have dominated the MAJOR awards (Golden Globes, SAG, Critics Choice) so far. Who Will Win: Remember when Marion Cotillard won in 2008? Julie Christie was heavily favored to win (although Cotillard had won the Golden Globe and countless Critics awards). This is going against the grain but I don’t think Sandra Bullock is going to win and I don’t think Meryl Streep is going to win. Sidibe and Mulligan have enough support that either one of these actresses will upset the heavily favored Bullock. Who Will/Should Win: Crazy Heart was Jeff Bridges film from beginning to end. He completely awed every moment he was on screen. He also enthusiastically hugged Robert Duvall in one scene. That is what really made the movie for me. Enjoy your Oscar dude. Who Should Win: Lee Daniels brought a difficult story to the screen; I hope Precious is a sign of great things to come from this director. Daniels is my personal preference but Kathryn Bigelow should win. Not because a woman has to finally win the Oscar but because she directed the best movie of the year. Who Will Win: Kathryn Bigelow. Her win will go down in Oscar history as a landmark achievement for women in Hollywood. But I will always remember that Bigelow directed one of the best movies of the year. The Best Picture category was expanded to ten nominees. We won’t know if this move was a success until after the telecast. If the truly best picture of the year wins (in my mind that is anything other than The Blind Side or Avatar) and the telecast ratings improve, then it was indeed a success. I loathe Avatar and everything it stands for as a movie. Yes, the technology was great and it will win those Oscars as it should. And it is lovely that Avatar is the BIGGEST MOVIE of all time. But has anyone stopped to think what Avatar 2 will be about? No. That’s why, if Avatar wins, I’ve lost my faith in Hollywood. Am I being alarmist? Yes. But someone needs to be. Should Win: Precious, Up in the Air, The Hurt Locker. See Academy. By giving me ten films to choose between, I am very indecisive. Will Win: The Hurt Locker. But don’t be surprised if Avatar wins. Previous Previous post: You Go Glen Coco!